We have just added another 50 cast metal items to our door furniture section listed under componants in our shop. These items extend our extremely popular range with a few items fulfilling specific customer requests. In August we will be introducing and extended range of doors, windows and skirting with many of theme pre-painted white to save you lots of time in your builds. We are pleased to finally unveil our newly designed website. Although the site has been tested please bear with us over the next couple of weeks as we iron out the inevitable kinks which we will find. We are pleased to announce the development of our new website which is due to be completed and live by the end of April 2018. The new site is designed with mobile devices in mind and will work on all phones and devices including PCs and Macs. The website has enhanced account features, improved checkout processes and is designed to run very quickly on all devices. There may be some intermittent issues accessing the website when we are upgrading to the new version which we will endeavour to keep to a minimum. To guarantee Christmas deliveries please order before 1pm on the 22nd December and select UPS as your courier. This only applies to our UK customers. Christmas is 2016 is nearly here! Merry Christmas to all of our customers who have helped make this a record year. We hope you have a great 2017. Black Friday 2016 is here! To celebrate the arrival of our new rug range, doors, windows and skirting, accessories and brass items we are offering a 25% discount on all web sales (excluding trade) for one day only! Visit the shop and take a look here. We have now updated our bulk packaging section with an incredible 62 designs making our selection up to 102 items in three sections: Food, Sweets and Household. Be sure to take a look. Hope you all had a Great Christmas and New Year! Its officially the new year and to celebrate will be shortly starting an A-Z of MyTinyWorld where we will bring you interesting news, competitions, free give-aways and much much more! Keep checking back in the coming weeks so you dont miss out! We have now discounted all of the flower kits by an amazing 10%!! 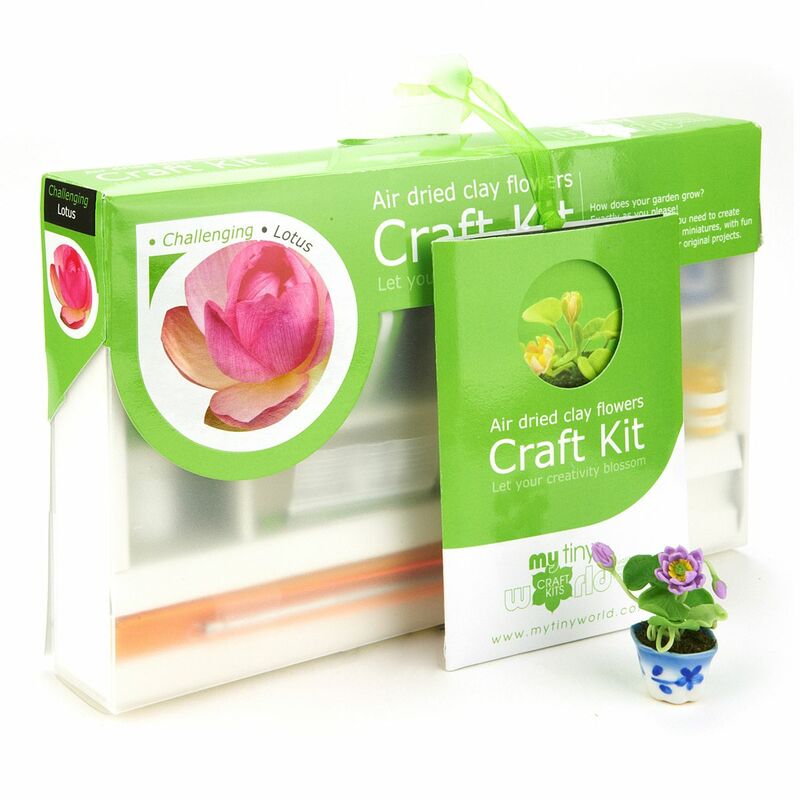 Be sure to take a look in our flower kits range as we accommodate for any crafty person from beginner to expert. Merry Christmas from everyone at MyTinyWorld. Today we are officially releasing our Christmas offer to get you into the spirit! We are pleased to offer our customers 20% off on all orders! You will need to enter the code: winter14 at the checkout. This offer is valid for the whole of December 2014. Offer excludes trade customers (already get a nice discount!). Happy Shopping! A new look to the site, plus many exciting developments. We have a new look and feel to the site making it a lot easier to locate what you require, plus an overview slideshow on the front page. We have been very busy creating new and exciting products for you. These can be found in our 'What's New' section. Currently in development is a 'create your own' biscuits/tarts/chocolates kit. 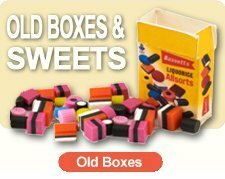 Each kit will contain everything you will need to create your very own delicious sweet treats for your dolls house. Watch this space for further news! MyTinyWorld is now a globally recognised brand, and can be located on the Amazon store worldwide! We have just extended our range of handmade german wood toys - click showcase at the top or go to our shop to view the new items. We have also just added a brand new category - Wallpaper! We have had over 10,000 searches for wallpaper on our website over the last 2 years so we realised that it was important to you. Instead of offering the same old tired wallpaper thats been around for years we decided to wait and develop a range of high quality, clear and desirable wallpapers. Check out our shop to view view the first 150. More coming soon! MyTinyworld has now completed upgrading the wishlist options. You can now use the quick click "add items to wishlist icon" under each picture in the shop view. We have also added the email a friend and email MyTinyWorld a question option. Regular users of the wishlist will now find an "Add all to Basket" and "Clear Wish List" option to allow management of larger numbers of items. Please note, ony customers with an account can use this feature as it needs to know who you are to save your items! MyTinyWorld are pleased to announce the new photo album and slideshow features are now available. This feature brings together product photos and staff recommendations in an easy to view, chronological order. Pictures can be clicked to show larger versions and can also be viewed in a automated slideshow with quick links to the items in the shop and indepth product information. MyTinyWorld have returned from a very successful Dolls House Show in Arnhem, Holland. Terrie and Paul, the company owners drove over on the friday to set the display up. It took just over 6 hours to get everything just right, having nearly 100,000 items of stock with them! The lighting was secured properly this year to prevent a reoccurance of random LED lights dropping from the sky. The doors opened at 11am this year, an hour later than normal. The army of keen miniaturists poured into the venue, and spent the 7 hours visiting 70+ high quality stands. Sunday, the doors opened at 10am and closed at 4pm. It was slightly quieter than the previous day but the show was a success for exhibitors and visitors alike. Our dolls house miniature glass range was extremely popular with the introduction of our premium glass range drawing particular attention from many of the American Visitors. Our brand new range of gingerbread houses and dolls house miniature flowers went down well, especially the tulips as one would imagine being in Holland! Many old friends met, many new ones made leading to new collaborations and products. We are always working hard to design and make new and exciting dolls house miniatures - this range of Dolls House Miniature Aged Wood Crates is exquisite. This wooden crates has been mildly aged for an authentic old look. Each of the items in our exclusive hand crafted wood category are made for us by UK craftsmen to the highest standards. We invite you to take a look at our dolls house wooden crates in 1:12th scale. Apologies to all our our customers for problems experienced in buying items from our website during the evening of the 4th October 2011 and all day 5th October 2011. We have been implementing a major update across the website to improve features, increase speed and introduce an extremely advanced shopping cart. Things did not go fully to plan resulting in many customers being told they had an empty shopping cart when they tried to check out. This has now been fixed and the upgrade completed. MyTinyWorld have added an article to their dolls house miniature blog about the how purchasing patterns have led to its miniature glass becoming the miniature gift of choice. The blog article can be found here. It is also linked via our face book account here. MyTinyWorld has been making jewellery for over 2 years. We supply many well known companies and some of the biggest online jewellery websites. Due to the demand for our items we have decided to launch our products direct to the public and have over 600 designs we will be introducing in the coming weeks. Many of our jewellery items are worn by celebrites and regularly feature in all of the main weekly magazines like Heat and Now. Our handmade dolls house miniature fruit and vegetables have always been in our top sellers list and we constantly get asked to add new items from all parts of the world. We have added 16 new items to the range and are working on 30 others. We are always working hard to design and make new and exciting dolls house miniatures - this range of dolls house miniature flower bunches is exquisite. We finally got all the pictures processed and products added to mytinyorld.co.uk. MyTinyWorld are please to announce the preview of our dolls house miniature flower kits. View the article on our blog. You can also find it through our facebook page. 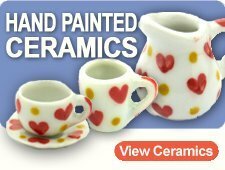 Dolls House Miniature Ceramics Range Expands By Another 300 items! Our already huge range of dolls house miniature ceramic plates, cups, jugs, bowls and general kitchenware has just been expanded by a further 300 items. Our long anticipated dolls house miniature ceramic animal additions have arrived. We have now added our latest free tutorial to our blog - this time on the subject of how to make a Koi Pond. View it on our blog. You can also find it through our facebook page. We have now added an extremely comprehensive whirlwind tour of how we design our custom dolls house miniature pub signs. View it on our blog. You can also find it through our facebook page. We have now added a how-to showing how we go about restoring a lot of dolls house miniature packaging, signs and posters. View it on our blog. You can also find it through our facebook page. We have now added alot of information on how we design and create our dolls house miniature packaging to our blog. You can also find it through our facebook page. We have just added a fully illustrated "how to make" tutorial for our famous miniature cakes online. MyTinyworlds Dolls house Blog has only been live for 5 days but has seen over 4000 visitors! We will be adding new how tos soon including dolls house food, miniature cakes, using our cutters and how we make our miniature glass. MyTinyWorld will be releasing 400 new sugar craft cutters over the next week expanding its existing range to nearly 500. The new range are made from long lasting aluminium and are designed to last many years. MyTinyWorld are the market leaders for high quality metal sugar craft cutters with its specialty being in the very small cutters. Building on this range we are now adding tools to work the cut clay and sugar paste. These cutters and tools are used by dolls house miniaturists, hobbyists and professional cake decorators as they are affordable, versatile and very high quality. As mentioned in the previous article we have launched our blog however it might be useful to tell you how to get to it! You can select it from the main menu on our website under the Home button or you can click this direct link to go straight there. As our blog is in its early stages, please hit the like button and tweet the links as this can be really helpful. We finally got around to creating our blog (weblog / diary)! We are using this to keep everyone up to date with what we are doing and posting many interesting articles on how we make things. Our article on making the magic herb labels has been exceptionally well received and we appreciate the patience shown by certain customers who have been waiting nearly a year for that! Keep your eyes open for the gateaux tutorial and some other exciting projects. Mytinyworld was invited to exhibit our unique range of dolls house miniatures at the Arnhem Dolls House Show in Holland on the 26th and 27th of March. We have been invited back to the 3 day show in October and will also now be exhibiting at all Brentwood fairs in the UK this year. We caught up with many old friends as well as having the opportunity to meet many new ones. We look forward to working closely with these friends int he future. Mytinyworld is starting to send tweets to followers on Twitter regarding new dolls house miniature products, offers, how to make articles plus much more. Mytinyworld is pleased to announce it has started using Facebook to showcase new and in design products. MyTinyWorld is pleased to announce in the coming months we will be releasing custom made unique dolls houses and buildings. Models will include Medieval Inns, Taverns and Coach Houses, castle, thatched cottages, Tudor houses and many other period pieces. MyTinyWorld are releasing a range of full size dolls houses, many of which are new to the UK. There is something here for every one - from house and shop in one, through country houses, half Tudor retreats up to a massive country estate mansion. Prices will range from a budget busting Â£80 to Â£160. MyTinyWorld recently released its totally unique and exclusive glass Apothecary range. This has become our best seller and we currently are preparing to release a further 150 items into this range. We have also released our cocktail range just in time for the long hot summer, demand one again has been staggering. We are currently preparing to release our summer range of flowers - 80 new ones in total - our new cake range - 150 new ones - our new furniture range - 150+ new items and our brand new glass range - 120 new items. Many of our products now have a "Bulk Buy - Buy more, save more" feature. This tells you the price you will pay for buying multiple of the same item. Prices are automatically adjusted in the shopping basket. Our Nail Art section is the first complete section to have this available. MyTinyWorld Trade customers receive the bulk buy benefits on top of their existing discounts. Many of our repeat customers have noted we have begun to add a logo and copyright information to our pictures. This is to prevent the high resolution images being downloaded by rivals and used on their own websites. One couple use our images of new products to send to their suppliers to have our items copied! We have also added other security features to our images to prevent misuse. Our apologies for any problems some customers have experienced accessing www.mytinyworld.co.uk website. Our Dolls House miniature website is one of the most popular around and has been struggling to cope with large numbers of simultaneous visitors. We have nearly finished the server upgrades and web optimisations and you should begin to see a much more efficient and speedy website. As many of our regular customers are aware, we are updating the website with over a 1000 new products. Most of the carpets have now been listed, our new ranges of ceramics and flowers are complete and we will be introducing a massive new range of glassware soon. We are currently working on over 40 types of dolls house miniature cheeses which will look absolutely fantastic, complete with authentic labels. In the next couple of months we will be releasing our new Apocathary range - over 150 bottles, jars and packets of Victorian Medical remedies using authentic labels and packaging! We will also be adding our range of over 80 tarts to the website. They have been a long time in designing but they are finally here and looking very good. Happy New Year, MyTinyWorlds great new year offering is a selection of free goodies worth 20% of your order value! MyTinyWorld is please to announce it has now moved to its new facilites and is fully operational. We are currently sorting through our stock of over 800,000 items of inventry across 4500 product lines to make them easy to view for visitors. MyTinyWorld has begun to move and answers to emails may take longer than usual. MyTinyWorld has become the sole UK & European distributor for the largest range of rugs and carpets made in Canada. We carry a range of over 400 products; Small, medium and large round, rectangular and square rugs & Carpets. We have stair runners, tapestries, wall hangings in virtually every period and style from 14th Century upto Art Deco and Modern. All of our carpets have a 3 unique qualities; 1)Excellent Price, 2)Fantastic Quality, 3)Lifetime Warranty. These will be listed soon. As many of our existing customers know, we have grown substantially over the last year resulting in us needing new premises. We have finally found what we were looking for and will be moving in for the 1st of December. Our new facilities offer us storage for 600 pallets, Kitchen facilities for visitors, trade counter and retail showroom. We are now able to run training courses from the new facilities and of course our well known workshops where we make alot of our products will also be there. There are many many more exciting projects we have lined up which we will tell you about over coming months. MyTinyWorld now offers customers the ability to view, print and download invoices for each order from their account management screen. To access this screen log into MyTinyWorld with either your account details OR an order ID and Order Number. We have now added a fail safe for when you are placing an order and your computer crashes, or you close your browser. Any items ordered are automatically remembered by the website, so the next time you log in you can carry on adding to your basket where you left off. This feature requires cookies to be turned on. Some exciting new features have been added to MyTinyWorld. It is now possible to sign up for our monthly news letter which will keep you up to date with all of our latest products. You can download a new order form if you prefer to post us your order. Our new catalogue is currently in the design stages, but you can request one now and it will be sent to you as soon as we have them. But if you cant wait you can download the electronic one NOW! 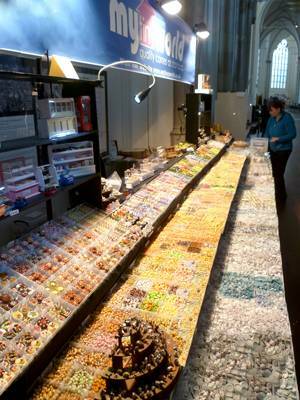 We will shortly be introducing an extensive range of fimo canes and fimo cane slices made by us at MyTinyWorld. Canes will include egg, cucumber, tomato, apple, pineapple, banana, kiwi, strawberry, feathers, and extensive range of flowers and many others. Canes can be sliced. The slices are used extensively in the making of miniature food however they have recently seen popular demand on the continent for use in nail art. We would be happy to undertake commissions for different and unique canes in any quantity. Due to repeated requests we have now added the Wish List feature. This allows you to add items to this list as you browse through our vast range of dolls house miniatures for your future reference. You can use the list to prompt friends and family as to what you would like to receive for a special occasion, or simply use it as your own shopping list. Whatever you use it for, you will quickly find it is an invaluable tool. Wow, what a 6 months we have had. We have introduced over 2000 new dolls house products, changed the website 3 times, advertised in magazines and started dolls house shows. Our orders have doubled pretty much every 2 weeks as customers have discovered that all of our dolls house products are low cost, high quality and in many cases hand made. We have had to really pull out all the stops to keep up with demand and have increased our stock to nearly 200,000 pieces. Well, frankly, alot. We have another 1000 products or so to introduce over the next 2 months, we are rolling out our plans to man at least 4-6 shows a month, upgrading our systems to cope with the huge demand and getting even less sleep than before! We are concentrating on introducing new lines to our dollshouse miniature food, clay flowers, glassware and electrical lights ranges - most of which will be available by the end of april 2008. We are now pleased to announce that you can place your order by telephone and pay by all major credit cards. We have just introduced a brand new range of 1/12 scale premium flowers which are all hand made and have very high levels of details and everyone is falling in love with them! We are currently designing tomato plants in grow bags, mushrooms on logs and chilli plants. New Dolls House products arriving soon! We aim to continually improve our product range and this month has seen a lot of activity. Exciting new miniature furniture sets and accessories have been ordered and shortly our DIY components will be boosted with new products. Our range of lights will be complimented by new additions and our ceramics range grows steadily bigger. So continue to watch this website as over 300 new products are shortly to be added! We have been receiving e-mails regarding our shipping time due to our January sale being very popular at the moment. MyTinyWorld.co.uk are pleased to say although we are flat out at the moment with orders, we are still able to get orders despatched within 24 hours. Due to the vast large amounts of orders we have had in January due to our Sale, some customers were experiencing the website slow whilst using our checkout. We apologise for any inconvenience this may have caused. This has now been resolved and the performance increase is now much improved. MyTinyWorld.co.uk is pleased to announce our sale has started. This is a perfect time for you to buy your dolls house items for even more savings. We have recently added a new category into our range. This is the "Collectors" category which currently holds numerous ceramic items including salt and pepper shakers, toast rack and numerous different tea sets. Christmas is gone, and spring is just around the corner. Check out the new items in the garden section which we hope to be extending soon, and a new range of potted flowers, in the plants and flowers section. A small bug has been fixed which prevented users who had firefox from purchasing using the Google Checkout option. Over the last week or so major upgrades have been made to the website to increase performance to cope with the level of visitors. We have also introduced a registration procedure to allow visitors easy access to previous orders and express checkout. To sign up click the "Sign Up" links on the top right of every page and then log in to access your account information. When logged in you will find that all of your details are automatically filled in for you when going through the checkout. We have added more products in our Boxes and Cans range. We have now got over 20+ Boxes and Cans. Also we have added Crisps into that range, so go check them out! Have you checked out our Glassware section? If you haven't then youre missing out. We've got a very large range of Glassware that we just can't stop adding to. All Glassware is handmade and has lovely detailing, it is very fine glass, so be extra careful. There's a wide range of Jugs and Glasses as well as Sundae Dishes, Fruit Bowls and beautifully crafted Decanters, all within the Glassware section. We've just got a whole new range of Ceramics. Not only have plate's and bowl's section's grown, but check out our new animal Ceramics, we've got chickens, frogs, cats and dogs, and much more. So take a break and have a look, I think you'll like what you see. Are you into a bit of D.I.Y, have a peek at our new Components section. We've got both Doors and Windows in a range of styles, and also some lovely looking picket Fences and picket Gates. So go on D.I.Y, and make your dolls house looking how you want it to. Check out our new range of Coca cola Stalls and Stands. We've got Fridges full of cans and bottles as well Pepsi Coolers complete with ice and bottles Don't forget our new 12 piece Coca Cola Crate. Although these may look good enough to drink please remember these are only meant for use in a dolls house. Our Accessories range just keeps growing. We now have over 70 different types of Accessories including those in the Kitchenware section. But it wont stop there keep your eyes peeled for more Accessories coming your way. Why not take a look at our new lovely dolls house Musical Instruments. We have a wide range of metal Instruments and also some lovely Drum Kits. So why not take a peek and see if you like them, we hoping to be adding more soon, so keep a look out. We now have a Market Stall, made from wood for all of your Fruit and Veg. You can buy it in kit form, pre-made with no stock, or pre-made and supplied with a VAST range and quantity of handmade Fruit and Veg. We are expecting a new shipment of Electrical Lights and accessories to be delivered in the next week or so. We will be adding them to the Electrical section of the products page as soon as we can. We also plan on releasing a large range of Furniture in the next couple of months. All of it is handmade and excellent quality. Due to popular demand we have added even more Cakes to our ultra realistic range. These are by far the most popular food item we sell and although they look fantastic on the website, customers can not believe how good they actually are when they get them. 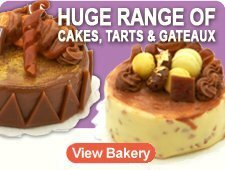 We will be adding another 12 Cakes to this range next month including pre-sliced Cakes. Keep your eyes out for them. This section has seen a vast range of items added over the last month or so. The Ice Cream Sundaes in the glasses seem to be very popular and are certainly my favourite Desert. A lot of Plated items like the donuts and waffles are new and we are looking at introducing pies such as cherry lattice and treacle tarts soon. You need to remember these are not toys - they are that realistic you find yourself wanting to go and make something to eat! We have added a comprehensive range of whole Fish and Meat products. All of these products are handmade from modelling clay. We are currently working on a expanding this range to include cod, salmon, herring and kippers, beef joints, sausages, salamis and various cooked sliced meats. We hope to introduce 2 or 3 new items to this range a week. 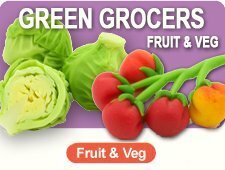 We have added a comprehensive range of loose and boxed Vegetables and Fruit. 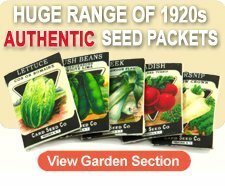 We are currently working on a large number of other traditional English Vegetables to add to this range such as open and closed cup mushrooms, parsnips, lemons and limes and potatoes.